“Wait, haven’t I seen this before?” That might be something an Arizonan will be asking themselves while watching their favorite flick. Arizona’s many sprawling deserts and beautiful urban areas have been the filming locations for countless movies. There’s the westerns in Old Tucson, big budget action movies in Phoenix, and road trip anthologies on Route 66. Arizona may not have the glitz and glamor of Hollywood but that hasn’t stopped the following movies from being filmed right in our backyard. Starring a large ensemble cast including Greg Kinnear, Toni Collette, Steve Carrell, and Alan Arkin, this indie film focuses on a family’s cross-country road trip to get their daughter to a beauty pageant. Though the onscreen family is technically from New Mexico, portions of the road trip were filmed in Arizona cities—including Chandler, Phoenix, and Flagstaff. “Everything Must Go” revolves around a relapsed alcoholic (Will Ferrell) losing his wife and job. He subsequently holds a yard sale on his front lawn in an attempt to reboot his life. While this comedy-drama doesn’t showcase Will Ferrell’s patented slapstick humor, it does showcase areas of the Valley. Filming was conducted around Phoenix and Scottsdale—with Ferrell’s house being located in the Arcadia area. Who can forget Clark Griswold’s classic Grand Canyon visit? After a few seconds of wonderment, Clark and the family were off to their next adventure. The classic Chevy Chase comedy revolving around a family road trip gone awry was actually filmed in several Arizona spots including Flagstaff, Monument Valley, and Sedona—-the site of Aunt Edna’s famous death scene. Okay, this one was easy. Tombstone, Arizona remains a famous tourist attraction for being the site of Wyatt Earp’s gunfight at the O.K. Corral. The 1993 film starring Kurt Russell and Val Kilmer revolves around the gunfight and the ensuing Earp Vendetta Ride. 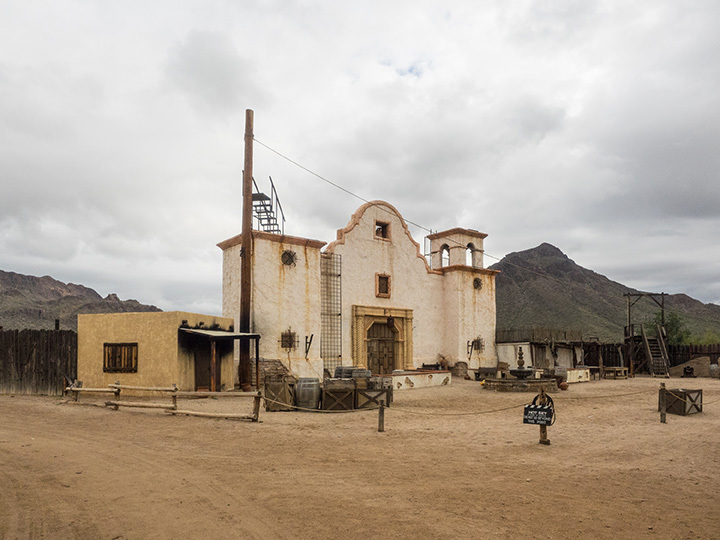 “Tombstone” was filmed primarily at the Old Tucson Studios in Benson, Arizona. Parts of a galaxy far, far away are actually located here in Arizona. The “Return of the Jedi” is the final film in George Lucas’ original “Star Wars” trilogy. After using parts of Tunisia to film the Imperial Sand Dunes in the previous films, Lucas and company wanted to stay closer to home. For the last film, they decided on building a set about 15 minutes away from Yuma around Castle dome peak. Alfred Hitchcock’s groundbreaking psychological thriller was set here in Phoenix. Most of the film, including the scenes at the Bates Motel, was filmed on set at Universal Studios in Hollywood. However, many Phoenix landmarks made the final cut—including downtown Phoenix’s Hotel San Carlos and the Jefferson Hotel. George Clooney, Mark Wahlberg, and Ice Cube starred in this drama set in the aftermath of the Gulf War. In order to make the setting look like Iraq, director David O. Russell needed a flat and barren desert landscape. He chose Arizona— with many of the scenes being shot in the deserts of Casa Grande. This 1980s comedy starring Robert Carradine, Anthony Edwards, and John Goodman is about a small fraternity of nerds rising up against bullies at Adams College. Adams College is actually the University of Arizona and most of the scenes were filmed on campus in Tucson. Alumni will notice Bear Down Gymnasium, Cochise Hall, and the Beta Theta Pi fraternity house all appear in the film. The Coen Brothers cult classic about an ex-con (Nicolas Cage) and an ex-cop (Holly Hunter) kidnapping a newborn was filmed in Phoenix and Tempe. The movie is chock full of local landmarks, including Camelback Mountain, Sun Devil Stadium, and Tempe Police Station. In this Cameron Crowe film, agent Jerry Maguire (Tom Cruise) is down to his last client, the eccentric wide receiver Rod Tidwell (Cuba Gooding Jr.), who just wants Jerry to show him the money. Tidwell is a Sun Devil and Arizona Cardinal, so it’s no surprise that we get to see him in action at Sun Devil Stadium in Tempe. Steve Martin, Chevy Chase, and Martin Short star in this irreverent comedy about silent movie stars forced to save a Mexican village from the famous (or infamous) El Guapo. Hilarity ensues while fish out of water actors sing and dance their way to heroes. Set in Mexico, much of the film was shot in Old Tucson Studios and the Coronado National Forest south of Tucson. This story about a small-time rancher transporting an outlaw by stagecoach is one of the most famous westerns and even spawned starring Christian Bale in 2007. While the remake doesn’t stay true to its Arizona roots, the original was filmed all over the state. Filming occurred in Old Tucson, Sedona, Dragoon, Yuma, and Willcox. Bill and Ted’s Excellent Adventure spawned a cult following, sequel, and countless Keanu Reeves memes. The comedy about two-burnout high school students time traveling through history was shot exclusively in Arizona. The movie was filmed around Phoenix at Coronado High School and local establishments like Sunsplash Waterpark. Notorious comedy “Major League” revolves around the Cleveland Indians’ lovable losers winning despite lacking talent and employing Charlie Sheen. Though most of the production occurred in Milwaukee, the spring training scenes were filmed here in Arizona. Part of the movie was filmed in current Arizona Wildcats Stadium Hi Corbett Field in Tucson. Few movies showcase Arizona’s natural beauty. One exception is Sean Penn’s “Into the Wild” starring Emile Hirsch. As Hirsch’s character hitchhikes to Alaska, audiences get a glimpse at many of Arizona’s lesser-known but gorgeous areas. Some of the areas captured in the movie include Kingman, Lake Mead, Topock and Page. View more Arizona Movie Theaters.